Regardless of one’s politics, a unifying philosophy that brings us all to the table is the realization that infrastructure has been a neglected element of society; and the urgent need to address it is now! 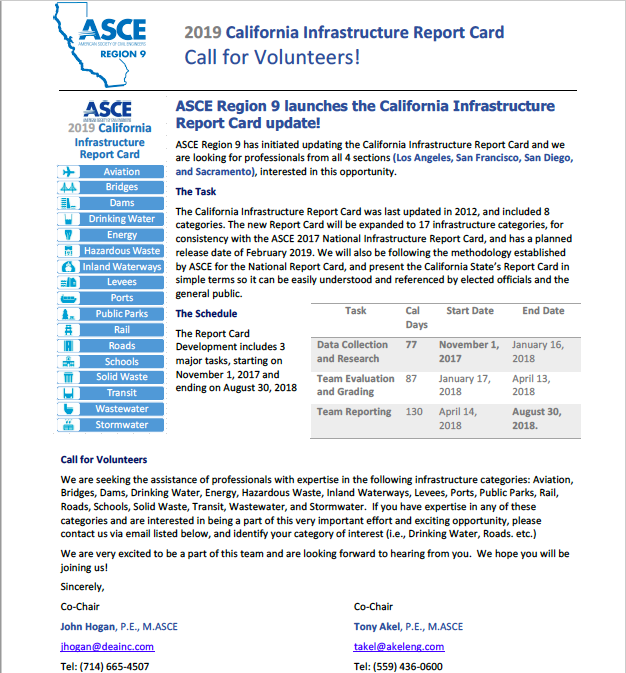 Every four years, ASCE provides a comprehensive assessment of our nation’s 16 major infrastructure categories through the Infrastructure Report Card (www.infrastructurereportcard.org). The Report Card assesses the infrastructure categories’ conditions and needs, assigning grades and making recommendations to raise those grades. Unfortunately, not much has improved since 1998. ASCE has yet to give a grade out of the “D” range; in 2017, America’s infrastructure earned a “D+”. Contrast this with the polarizing discussion on climate change and its potential impact to infrastructure, the economy, and to us as a human race. This may be changing. A definitive report (Climate Science Special Report, science2017.globalchange.gov) released by the White House in November 2017 asserts that based on “a large body of scientific, peer-reviewed research,” global annually averaged surface air temperature has increased by about 1.8 Fahrenheit (1.0 Celsius) over the last 115 years (1901–2016). In addition, the report indicates that “this period is now the warmest in the history of modern civilization”. As civil engineers, we are integral to the planning, design, construction, operation, maintenance, decommissioning, and renewal of infrastructure systems. ASCE Policy 488 (http://www.asce.org/issues-and-advocacy/public-policy/policy-statement-488—greenhouse-gases/) provides guidance and supports a number of public and private sector strategies and efforts to achieve significant reductions in greenhouse gas (GHG) emissions through the planning, design, construction, renewal, operation, maintenance and decommissioning of existing and future infrastructure systems. Doing so fosters progress and creates opportunities for civil engineering leadership to significantly lead reducing GHG emissions. The political contrast between infrastructure and climate change cannot be taken lightly. As there are observed increases in the occurrence of severe weather events, extreme heat and flooding, and increasing surge and water impacted areas that may be due to sea level rise; we need to consider a new baseline in building new infrastructure and maintaining or retrofitting the existing ones. This is important as the need for a reliable and safe infrastructure system is critical to continue on with the conduct of all aspects of our lives, our society and our economy. In Fall 2016, the California State Legislature passed AB2800 (Quirk), “Climate change: infrastructure planning” that requires the California Natural Resources Agency, by July 1, 2017, and every 3 years thereafter, to update the state’s climate adaptation strategy to identify vulnerabilities to climate change by sectors and priority actions needed to reduce the risks in those sectors. This bill put California at the forefront of making infrastructure more resilient. This bill, through July 1, 2020, also requires state agencies to take into account the current and future impacts of climate change when planning, designing, building, operating, maintaining, and investing in state infrastructure. The bill also would require the establishment of a Climate-Safe Infrastructure Working Group for the purpose of examining how to integrate scientific data concerning projected climate change impacts into state infrastructure engineering. California Natural Resources Secretary John Laird appointed me to be a member of the Working Group early this year, with the endorsement of ASCE. Other members of the Working Group consist of registered professional engineers with specified relevant expertise from the Department of Transportation, the Department of Water Resources, the Department of General Services, and other relevant state agencies; scientists with specified expertise from the University of California, the California State University, and other institutions; and licensed architects with specified relevant experience. The Working Group will convene its first meeting on January 18, 2018 in Sacramento; by mid to late 2018 (ideally by July 1), the Working Group is expected to develop and make specified recommendations to the Legislature and the Strategic Growth Council on how to incorporate climate change impacts to infrastructure. The deliberations are expected to be robust and comprehensive. Among the considerations are the current informational and institutional barriers to integrating projected climate change impacts into state infrastructure design; critical information that engineers responsible for infrastructure design and construction need to address climate change impacts; and selecting an appropriate engineering design for a range of future climate scenarios as related to infrastructure planning and investment. The ASCE Committee on Sustainability has been charged by our Board of Direction to coordinate the efforts on these and related issues. One of its affiliate committees, the Committee on Adaptation to a Changing Climate, will release early next year a 240-page manual of practice on adaptive design and risk management. That manual is expected to provide the foundation for ASCE standards. Additionally, the Committee on Sustainability has proposed the development of an ANSI standard for sustainable infrastructure projects. This standard is anticipated to be performance-based and will provide guidance on how to incorporate the principles of sustainability in all facets of the planning, design, construction, and operations and maintenance process of the asset over its life cycle. As you can see, there’s more to this and we need civil engineers to be involved. I would like to hear input from you on the above topics. Your contribution means a lot to the State as well as to our organization. Please contact me at cliban@hotmail.com to engage.